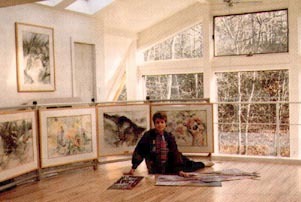 Tucked into quiet woods near the water, Hampton Knoll Studio reflects the warmth of Master Artist Joan Klutch and the serenity of East Hampton... renowned for its art galleries, cultural events and white sandy beaches. After up-close lecture and demonstration, retreat to the spacious work areas in the fully-equipped studio that is designed to enhance the artist's creativity. For those who prefer painting on location, this studio offers many outdoor work areas, surrounded by a beautiful garden and swimming pool. Palms sway in the breeze while boats glide on the quiet bayou's water way. The Harbour Lane Studio celebrates the all natural beauty of this inspirational, lush paradise. Sanibel Island allows the student a relaxed, yet invigorating experience. The split level studio provides a spacious and comfortable experience in a bright, glassed-in environment. From morning lecture to an afternoon of serene painting, the natural surroundings afford the student an opportunity to capture nature at its very finest.